Earlier this year, the Trump administration released some broadly outlined proposals to overhaul the federal tax code. Households in Texas would not benefit equally from these proposals. The richest one percent of the state’s taxpayers are projected to make an average income of $2,019,900 in 2018. They would receive 59.3 percent of the tax cuts that go to Texas’s residents and would enjoy an average cut of $173,900 in 2018 alone. Officials in the Trump administration have said that their tax plan will help the middle-class, but that is not true of the proposals they have put forward so far. For example, in Texas, the middle fifth of taxpayers in terms of income are projected to make an average income of $50,500 in 2018. 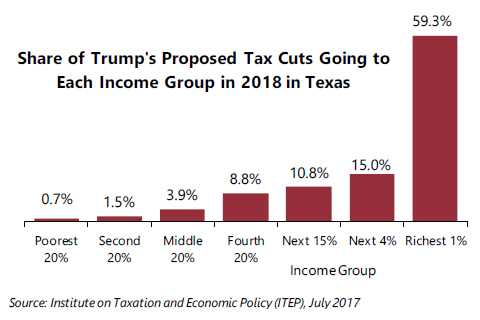 This group would receive just 3.9 percent of the tax cuts next year in Texas compared to the 59.3 percent of the tax cuts received by the richest one percent of the state’s residents. The bottom three-fifths of taxpayers (the lowest-income 60 percent of taxpayers) in Texas will all make less than $63,100 in 2018. They would gain very little, just 6.1 percent of the tax cuts that go to residents in the state. The average tax cut for this group next year would be $300, which is tiny compared to the average $173,900 going to the richest one percent. Trump’s tax proposals would reduce total federal revenue by at least $4.8 trillion over ten years. In the short-run this might just mean higher government deficits, but eventually Congress and the President would almost surely have to cut major programs like Medicare, Medicaid, food assistance and others to offset the costs. Low- and middle-income families would probably lose far more as a result than they gain from the small tax cuts President Trump would provide them. Politicians who propose tax cuts sometimes argue that no one should be surprised if they mostly benefit the rich. They argue that the rich make most of the income, so of course they receive most of the tax cuts. But their argument is misleading. The richest one percent receive a larger tax cut than everyone else under Trump’s proposals even when it is measured as a percentage of their income. In Texas, the richest one percent would receive a tax cut equal to 8.6 percent of their income. The bottom three-fifths of taxpayers in the state would receive a tax cut equal to just 0.9 percent of their income. These are described in more detail in ITEP’s longer report on the Trump tax proposals. Repeal of the 3.8 percent tax on investment income for the rich. Repeal of personal exemptions and doubling of the standard deduction. Replacement of current income tax brackets with three brackets, 10 percent, 25 percent, and 35 percent. Elimination of all itemized deductions except those for charitable giving and home mortgage interest. Special tax rate (15 percent) for businesses that do not pay the corporate income tax. New deduction and tax credit for child care. Repeal of special tax breaks for businesses and reduction in the corporate income tax rate from 35 percent to 15 percent.